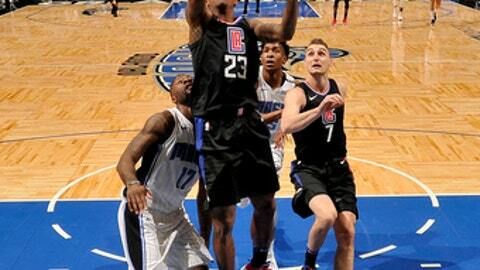 ORLANDO, Fla. (AP) The Los Angeles Clippers needed someone to provide points and Lou Williams filled that role. Much of the scoring power of both teams was sidelined by injuries, and guard Austin Rivers was added to the Clippers’ injury list with a concussion. ”We don’t have the luxury of talent where we’re going to out-talent the other team. Every night we find somebody to help us score. Tonight Sam (Dekker) helped us. Lou was Lou,” Clippers coach Doc Rivers said. Austin Rivers left the game in the final seconds of the first half after running into the elbow of Simmons. He did not return and will not play in the Clippers’ next game. Magic: With F Aaron Gordon (concussion) and G Arron Afflalo (back spasms) out, the active roster included four players from the G League’s Lakeland Magic. One was rookie F Wes Iwundu, who made his first NBA start. … Rookie F Jonathan Isaac hopes to return to practice Thursday after missing 17 games with a sprained right ankle.